Carson McCullers turns 100. Poet Sue Brannan Walker gets busy. 2017 is already proving to be a busier year than most for Alabama Poet Laureate Emeritus Sue Brannan Walker. 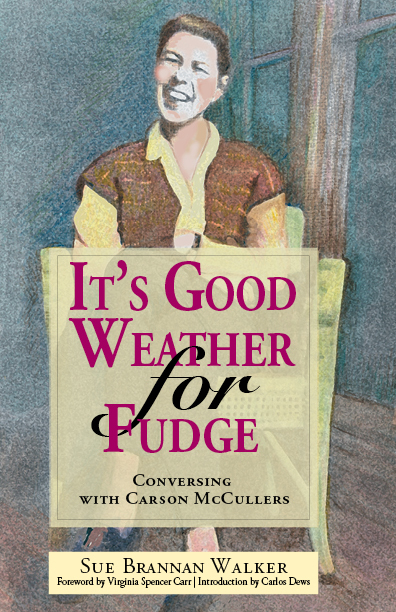 January saw the publication of her imaginative long-form poem It’s Good Weather for Fudge: Conversing with Carson McCullers, with an introduction by McCullers scholar Carlos Dews, released to commemorate the 100th anniversary of McCullers’s birth on February 19. Fittingly, the first official event for the new book was hosted by the Georgia Center for the Book — Columbus, Georgia being the birthplace of Ms. McCullers. Walker will present at the Alabama Writers Symposium and public libraries in Mobile and Demopolis, Alabama, traveling to New Orleans, New York City, Georgia again, and beyond for other events. A most-anticipated stop will be in Rome, Italy this coming summer, where she will be a featured presenter at the Carson McCullers Centenary Conference hosted by John Cabot University. In addition to her activities recognizing the McCullers centenary, Walker wrote the script for a Eugene Walter Reader’s Theater program, which premiered last month to an SRO crowd in the new Hilton Garden Inn Eugene’s Monkey Bar & Grill in Mobile. Walker’s script was based on Walter’s short story, “The Byzantine Riddle.” Next month, a new book of Walker’s poetry, Let Us Imagine Her Name, is due out from Clemson University Press. Whew. It’s Good Weather for Fudge is available from NewSouth Books or your favorite bookstore.